If you ever needed one single good reason to consider joining the podcast revolution, here it is. 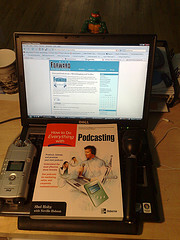 An estimate by eMarketer.com places the growth in podcasting at 250% by 2014. Folks, that’s just two short years away, and if our guess is correct, the trajectory is only going to keep climbing from there. What’s the big deal about podcasting? Well, it’s like terrestrial radio except you get to listen to WHAT you want, WHEN you want. If you haven’t tried partaking of podcasts yet, surf on over to iTunes or Blubrry and browse through the selections. If you have an interest, there’s a good chance you’ll find it represented. While there are plenty of ways to start your own podcast, none of them have to be very complicated. One of the easiest ways is if you have already written or published a book. It would be oh so simple to record and upload a chapter a week. You might be surprised at the result. Some people who don’t take the time to sit down and read are more than willing to download a podcast and listen to it while driving, working out, or pretending to listen to the preacher during church. The point is podcasting provides what is sometimes called “walk away” content. We like to say it’s asynchronous, a fancy word referring to the idea that the recording and playback can take place at wildly different times. This is a markedly different approach from terrestrial radio. In the old world (yesterday) you were out of luck if the host said something you were interested in while you happened to be in the backyard screaming for the dog to shut up. Not so with podcasting. You download the content and listen to it whenever the heck you want. On the go. In bed. Listeners can even setup their MP3 player and software to automatically check for and download new episodes while they sleep. What could be easier? Your only task is to wake up in the morning (which most of us do out of habit anyway), grab the player, and you’re out the door with fresh material. There’s something about radio that manages to persist in popularity even in the face of technology’s distracting onrush: computers, Internet, video games, cell phones, PDA’s, tablets, ereaders. People just love to listen to radio, and with podcasting, it’s radio they control. How should you get started? Luckily, podcasting is one of the few examples of a non-complicated technology. It’s really as simple as recording your voice speaking into a microphone as an audio file on the computer. After that, name it, format it, upload it, and promote the heck out of it. In the example of turning your book into a podcast, pick a posting schedule (a chapter a week seems to suit most peoples’ tastes) and you’re good to go. If you don’t have a book, you can pick any topic under the sun about which you have some expertise and talk about that. Of course, there is a certain amount of planning that should go into each episode in order to make it sound as professional as possible, but we’ll talk about that stuff in future articles. For now, we want you to wrap your brain around the idea that not only is podcasting something you could do, it’s something you should do. Some previously unknown podcasters have ended up with book deals on nothing more than the strength of their podcasts. Some examples are Grammar Girl, JC Hutchins, and Scott Sigler. Sigler managed to podcast his way into a five book publishing deal with Crown Publishing on the strength of podcasting novels for free. The point is this: there’s no limit to how far podcasting might take your career, and until you give it an honest try, you’ll never know world of possibilities. Speaking of Wealth founder Jason Hartman has leveraged the 200+ episodes of his original podcast The Creating Wealth Show into a global phenomenon which is regularly download in dozens of countries around the world. Who’s to say you couldn’t do the same?